Emails alleged stolen out of Mayor Dawn Zimmer's office, part of a well publicized 2011 FBI investigation, found their way to virulent opponents of her Administration according to evidence presented in the Lane Bajardi defamation trial dismissed last week against two Hoboken political website owners. The complete series of emails exchanged are made public here for the first time. The emails at question, originating from the mayor's office in February 2011 are part of a defense trial exhibit, (public information) having been turned over by former plaintiffs Lane Bajardi and Kimberly Cardinal Bajardi to former defendants, Nancy Pincus and Roman Brice. The source of the emails sent the data to Perry Klaussen in February 2011 who promptly sent them to Lane Bajardi, asking first if he'd be interested. Klaussen in a February 27, 2011 email to Bajardi asked if he wished to receive "quite a bit of data" about the Fired Department Audit - part of - "denied OPRA requests." As obtained emails revealed, Lane Bajardi penned numerous word-for-word ghostwritten articles with specific production direction for Klaussen to publish on Hoboken411. The articles were vastly political in nature on behalf of what the court described as the Russo faction and Councilwoman Beth Mason against Mayor Dawn Zimmer and what's commonly called the reform movement. Hudson County Superior Court ordered Bajardi name all Hoboken411 articles he wrote but was never satisfied. Discovery production however saw literally thousands of emails between Klaussen and Bajardi mostly between 2007 and 2011. OPRA, (Open Public Records Act) are legal requests for public information to NJ government entities, in this instance the City of Hoboken. Based on investigation in the City Clerk's office where public examination of OPRA requests are allowed, no such legal requests on the mayor's emails in question were approved - among a hosts of emails inclusive of those on the afternoon of February 23rd. Bajardi responded the same evening replying "send them" saying he is at a party and needed "to take the weekend off from this stuff." According to defense counsel Stephen Katzman of Methfessel & Werber, Mayor Dawn Zimmer was prepared to testify last Tuesday neither Perry Klaussen or Lane Bajardi were authorized to legally possess her February emails a mere 48 hours after her office exchanged numerous electronic communications on the subject of a working Hoboken Fire Department audit draft. The mayor's testimony was not needed as the entire case was thrown out of court. The 2011 Hoboken Fire Department audit was part of the administration's internal examination on manpower while sensitive union negotiations were taking place. Earlier OPRA requests for drafts of the fire department audit were denied as premature and not available to the public. After the April 25th, 2014 discovery end date in the litigation, a document dump of tens of thousands of emails from Lane Bajardi and Kimberly Cardinal arrived from their attorney Jonathan Z. Cohen of Wayne, PA to then defendants the eve of the July 4th holiday weekend. With the original case's trial date slated in late July and subsequently September looming, defendants began an intensive week long review, discovered the suspicious timelines of emails from Mayor Dawn Zimmer's office and promptly filed motions to the court with the evidence. After the defamation trial was thrown out of court last week, Defense counsel Stephen Katzman called the one allegation against Pincus by Lane Bajardi surrounding potential involvement in the email theft conspiracy, the solitary one possibly construing a defamatory meaning. Lane Bajardi in his July 17, 2014 deposition offered denials about involvement in the alleged stolen emails out of the mayor's office. 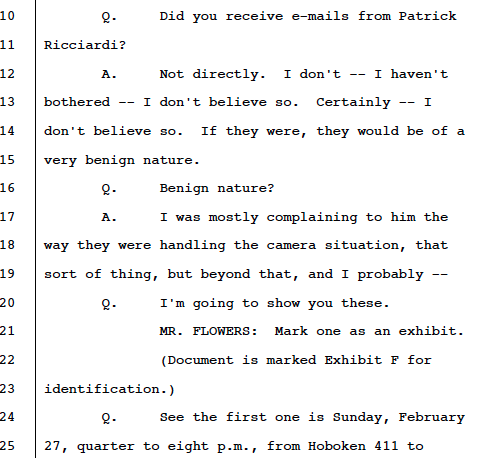 Asked by Screen Name Defendants attorney Kerry Flowers if he had received stolen emails from the mayor's office originating from former IT Manager Patrick Ricciardi, who was later convicted of the massive theft, Bajardi offered he "didn't think so" and if they were they would be of a "very benign nature." 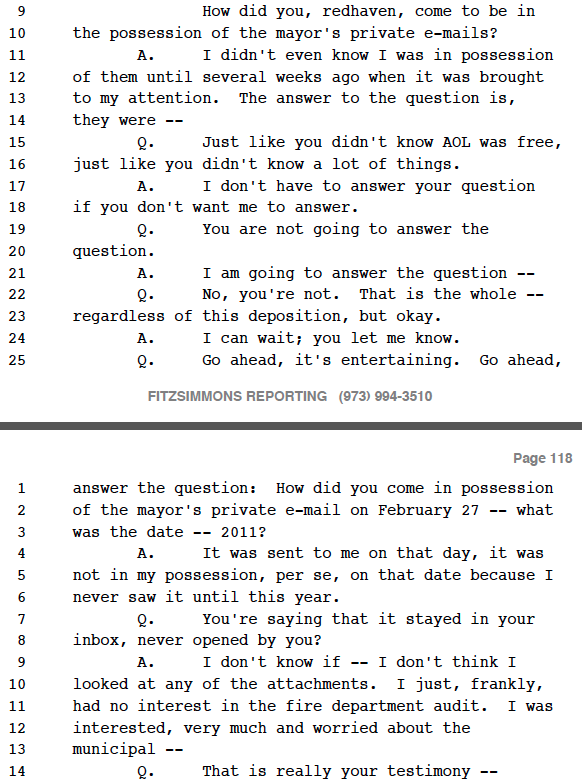 Later in the deposition Lane Bajardi remarked he "didn't even know" he had them (the mayor's emails) adding, "it was not in my possession per se..."
Saying he didn't "think" he "looked" at any of the (email) attachments, at trial Bajardi would offer a different defense. Under withering cross examination by Stephen Katzman, he claimed the alleged stolen emails weren't on his computer, repeatedly referencing a third party email vendor that collected the data from he and his wife. A back and forth semantical argument raged for about 20 minutes concerning what constitutes an email with attachment on one's personal computer. Judge Patrick Arre intervened asking if the emails in questions were provided to the defendants by the plaintiff. Answered in the affirmative, the judge said emails were given to defendants by plaintiff and ordered the cross examination move on to the next question. Last Tuesday, the judge in his dismissal of the case stated Lane Bajardi had stolen emails from Mayor Dawn Zimmer in his email account. In November 2011 the FBI detailed in its complaint against former Hoboken IT Manager and convicted felon Patrick Ricciardi, the Data Theft Ring conspiracy was in full swing going back to early 2010. Ricciardi had automated the theft of all emails coming and going with the mayor's office. MSV reviewed months of OPRA requests in late 2010 and into March and could not identify a possible source of legal requests made via OPRA for the mayor's emails in the trial exhibit particularly all those on February 23rd, 2011. The person emailing Perry Klaussen the information is believed a senior Hoboken fire department official identified in the emails as HC sidemouth. 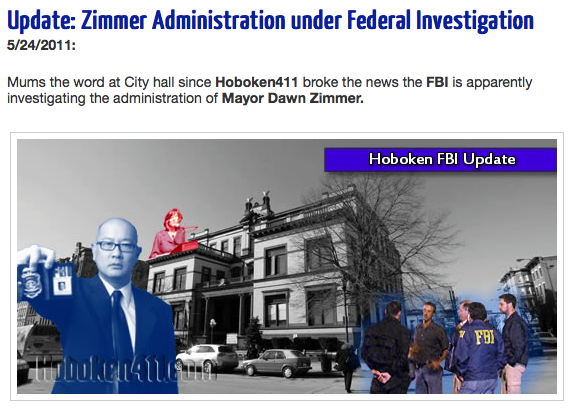 In late May 2011 right before Memorial Day Weekend, the FBI came to Hoboken and blew wide open concerns of possible systematic looting of electronic information in Mayor Dawn Zimmer's office. 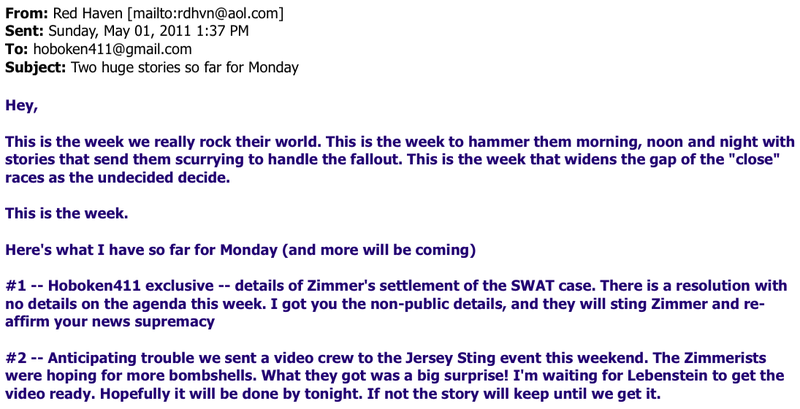 Lane Bajardi which discovery emails confirms was the political ghostwriter on Hoboken411 for years until at least July 2011, penned a conspiracy theory claiming Mayor Zimmer and her staff were not the victims of massive emails theft but the FBI's targets. Based on confirmed emails between Perry Klaussen and Lane Bajardi, the prolific ghostwriter pushed a conspiracy favorable to Councilwoman Beth Mason, a feature of his years long public and private political efforts to advance her political career. Former senior advisors of the Beth Mason for mayor 2009 campaign staff also say Bajardi was earmarked for a job in any Mayor Mason administration. Patrick Ricciardi who appeared as a witness for Lane Bajardi at trial balked at questions asking who he gave the mayor's information to saying he had not directly provided them to Lane Bajardi. When asked to name others he gave emails out of the mayor's office, Riccardi clammed up saying "ask the FBI." Judge Patrick Arre ordered Ricciardi to answer but he refused. Defense counsel Stephen Katzman asked specifically if Ricciardi had given any stolen electronic information to Perry Klaussen of Hoboken411 who he was often seen with around City Hall. No answers followed as objections would be raised by Lane Bajardi's attorney and Ricciardi was abruptly dismissed after his brief testimony. Unlike a criminal case, testimony can not be forced of uncompliant witnesses in a civil trial. Earlier in the same month, Lane Bajardi bragged to Perry Klaussen how he obtained for him "non-public information" in the notorious Hoboken SWAT discrimination case. Here Lane Bajardi informs Perry Klaussen on stories he is ghostwriting for the upcoming week stating "more will be coming." In his second point, he writes of anticipating trouble so "we sent a video crew to the Jersey Sting event" held at the Hoboken library. Bajardi referenced a local videographer who worked for Beth Mason and says the "story will keep" until the job is ready referencing the political operation to aid Mason ally Michael Russo. The third ward councilman was under fire after an MSV story detailed he met with FBI informant Solomon Dwek and agreed to a series of bribes asking a $5,000 check be made out to "Russo for Hoboken." The Lebenstein video would later appear on Hoboken411 where Bajardi attempted to rehabilitate Russo in a story on the event as a good guy leading into the Hoboken May 2011 City Council ward elections. An official from the press office of the US Attorneys Office in Newark responded to the public trial exhibit of mayor's office emails stating, "We have no comment." Talking Ed Note: Perry Klaussen, owner of the Hoboken411 blog was not contacted for this story. Emails obtained in discovery show earlier inquiries made to him by MSV were directed to Lane Bajardi and never saw reply to the questions. Former plaintiffs Lane Bajardi and Kimberly Cardinal Bajardi made two discovery dumps in mid May and then on July 1, 2014. While receiving tens of thousands of emails, former defendants in the case have no belief the discovery provided was complete. Numerous court orders were NEVER satisfied after numerous motions filed to compel discovery: inclusive of emails, financial records, and nothing of landline phone records and a Bank of America account. At the early June City Council meeting, Beth Mason replied to the public question made by this editor saying she would respond to the inquiry if she saw private emails with City Hall after public portion. She then offered no response whatsoever. After the early July 2011 City Council meeting, in an interview with MSV outside the steps of City Hall, Beth Mason responded twice to a question if she saw any of the emails out of the mayor's office saying, "I didn't see yours." Months later, in the fall of 2011, after the arrest of IT manager Patrick Ricciadi, Beth Mason repeatedly interrupted MSV during a November City Council meeting saying she had not seen the stolen emails out of the mayor's office.